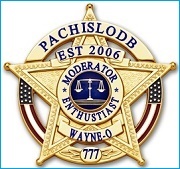 We are Alive and Well here at PachisloDB! For those looking to still get their fill of pachislo related information pachislodb.com is still alive and flourishing. If you have an addiction known as Pachislo, then you have come to the right place. Join in the talks with others who live and breathe the addiction! There is a lot of information about pachislo machines on the net, but it is either all in Japanese or is biased by a vendor selling the machine. This forum was created to help aid in exchanging information about pachislo machines. Several members here are more than happy to help you in furthering your education in these machines and help with any problem you may come across. If I find a machine I like/want and can live with the asking price, I buy it. Pretty simple! i would say that this site is the closest thing you will ever find to a blue book. For those having trouble getting access because of server problems, I was able to get in through Google's cached pages.